Domestic Drones | Passing Through . . . .
Drones: A Booming Business? : Unmanned aerial vehicles, also known as drones, may soon become commercialized. 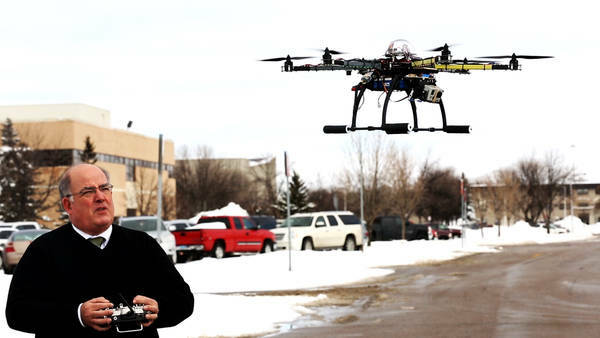 In Grand Forks, N.D., people are preparing for a coming boom in drones-related business. GRAND FORKS, N.D. — On the pilot’s computer screen, planted at ground level a few yards from the airport runway here, the data streaming across the display tracked an airplane at 1,300 feet above a small city on the coast, making perfect circles at 150 miles per hour. Benjamin Trapnell, an associate professor of aviation at the University of North Dakota, with a remote-controlled vehicle known as a hexocopter. Andrew Regenhard and Meagan Kaiser, students at the University of North Dakota, with an unmanned plane and remote control. Benjamin Trapnell, a professor at the University of North Dakota, mounting a video camera to an unmanned aerial vehicle. To the pilot’s right, a sensor operator was aiming a camera on the plane to pan, tilt and zoom in a search among the houses on the ground for people who had been reported missing. On his screen, cartoonlike human figures appeared in a gathering around a camp fire between the houses. “There they are,” Andrew Regenhard, the pilot and a student, said in a flat tone that seemed out of place with a successful rescue mission. In fact, no one was missing; the entire exercise used imaginary props and locales. Mr. Regenhard was taking part in a training session at the University of North Dakota. 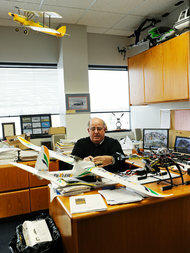 The first to offer a degree program in unmanned aviation, the university is one of many academic settings, along with companies and individuals, preparing for a brave new world in which cheap remote-controlled airplanes will be ubiquitous in civilian air space, searching for everything from the most wanted of criminal suspects to a swarm of grasshoppers devouring a crop. The burst of activity in remotely operated planes stems from the confluence of two factors: electronics and communications gear has become dirt cheap, enabling the conversion of hobbyist radio-controlled planes into sophisticated platforms for surveillance, and the Federal Aviation Administration has been ordered by Congress to work out a way to integrate these aircraft into the national airspace by 2015. The rapidly expanding market has not gone unnoticed by lawmakers and privacy watchdogs. On Wednesday, the Senate Judiciary Committee will hold a hearing on the privacy implications of drones like the ones being developed at Grand Forks. Some fans of the technology wince at the word “drone,” which implies that there is no pilot. And they have grown resentful about the alarms raised over privacy issues, noting that a few city and state governments have begun banning drones even where they do not yet operate. Tom K. Kenville, chairman of the North Dakota chapter of the trade association, Unmanned Applications Institute, International, said such bans would discourage technological progress. “I don’t think we had rules for the road before we had roads,” he said. Back in the university lab, Rico Becker, a software developer with Corsair Engineering, which had written a program for the students, emphasized that the “missing persons” exercise was just one of many hypothetical missions that students would fly, and was purely theoretical. “We’re not training pilots to spot people camping in their backyards,” he said. Aside from the missing persons mission, experts here outline a number of uses for the planes: “precision agriculture,” with tiny planes inspecting crops several times a week for the first sign of blight or insect invasion; safety missions by semiautonomous flying machines that could cruise the two-mile length of a freight train and examine the air brakes on each car, far faster than a person could, and be available for accident assessment in case of derailment; inspection operations of pipelines or power lines, a job that is notoriously dangerous for helicopters, and scouting out fires or car crashes. Volunteer fire departments in places like Grand Forks, Mr. Kenville said, would provide a clear market. An unmanned vehicle, he said, was “going to beat all the cars there,” to determine the scope of a problem. “If it’s a chemical fire, it will tell us to stay away, or it’s just some hay bales, drive slower,” he said. Remote control equipment might even displace some human pilots, in the cockpits of cargo planes. “This is money,” said Matthew L. Opsahl, in another part of the University of North Dakota simulation lab, at a work station where an operator could coordinate the activities of several remotely operated planes. One person could handle six cargo planes at a time, he said, or direct ground-based crews of several remotely operated planes that were scanning a large-scale event, like a spreading forest fire. The operator could compare the aerial images with those from Google maps, identifying street names and addresses to forward to a 911 call center. Mr. Opsahl, a former pilot on a regional jet, is now an instructor in the North Dakota program, where Mr. Regenhard, 21, a junior from Prescott, Wis., has a double major in commercial aviation and in unmanned aerial systems. Mr. Regenhard is also building a six-rotor helicopter that will beam pictures back to the ground, one that might inspect rooftop air-conditioners or offer a bird’s-eye view of a crime scene. Equipped with a GPS sensor and a $220 autopilot, it can be programmed to fly to a sequence of coordinates, at various altitudes, much the way an airliner can. Or it can simply broadcast its position to a distant ground station, where an operator can use a computer keyboard and mouse, or a joystick, to direct it. The unresolved question is how to avoid midair collisions, because the operator on the ground cannot see other traffic in the air. The F.A.A. plans to have a system ready by 2015 called “sense and avoid” in which each plane in the sky, manned or unmanned, uses GPS equipment to locate itself, and sends that information to a computer on the ground that draws a map showing all targets. The computer then rebroadcasts that map to every pilot in the air — or at a computer workstation on the ground, as the case may be. The progress of electronics seems relentless. Mr. Anderson, of 3D Robotics, said that all the components in a drone — a fast processor, a good battery, a GPS receiver and microelectromechancial sensors — were present in an iPhone. The rapid progress has driven a burst of commercial activity, along with a lot of anxiety. Mr. Regenhard was teamed up one recent afternoon with Mr. Becker, whose company had written a program that simulated a Cessna 182, a single-engine plane familiar to generations of student pilots, and was integrated with a variety of computer-drawn landscapes, some real, some artificial. Among the software tricks, the terrain map on Mr. Regenhard’s screen showed a moving red cone, like a searchlight, that was sometimes broad and sometimes a pinpoint, indicating the field of view through the camera controlled by Mr. Becker, giving the pilot a good idea of what the sensor operator was looking at, and thus how to direct the plane. As demonstrated here, the technology seems whiz-bang but unthreatening. The unmanned aerial systems include a ground station, usually a laptop with some communications gear attached, and some of the flying vehicles weigh only a few pounds. Even many of the larger ones will fit into molded cases that go comfortably into the trunk of a car. Some take off when the operator throws them, like a javelin or a football; some of the larger ones are intended to be launched from a catapult that could sit in the bed of a pickup truck. The field is embryonic. “We’re in the Wilbur Wright years of the U.A.S. industry,” said Bruce Gjovig, director of the Center for Innovation, a business incubator, at the University of North Dakota. Benjamin M. Trapnell, an associate professor and a mainstay of the unmanned aircraft systems program here, one of only three nationwide to offer a bachelor’s in the field, said the trick was not just in learning to fly such vehicles, but also in designing them, including the cameras or other sensors they could carry, and the ground stations from which they can be controlled. “You may not see that kid coming down the street to take a look because he thinks a helicopter is really cool,” Mr. Howe said. But at the same time, he said, his light helicopters cost $1,100 an hour to charter, and a lot of survey work could be done with a drone instead, mapping out what a manned helicopter would be needed for. Mr. Anderson, in contrast, said that later this year, his company would introduce a helicopter for agricultural surveillance that would sell for less than $1,000. “That’s not per hour, that’s for the helicopter,” he said.